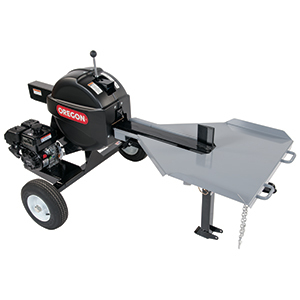 Oregon expanded its lineup of log splitters with the addition of the Kinetic Log Splitter. The new log splitter features two, precision-balanced, 70-pound flywheels spinning at 325 rpm to create and store kinetic energy. A pinion gear system applies that stored energy from the flywheels and drives the log through the wedge in roughly 2-3 seconds with minimal to no kickback, according to the company. The splitter can be towed on the highway with its 2-inch ball coupler and safety chains. The 32-inch-wide work table allows easy access to rounds and re-splits from either side, while the stow-away retractable tongue makes loading and unloading easy, the company said. Powered by a Kohler SH265 engine, the splitter features a 6-inch wedge and the entire machine sits on 4-inch-by-8-inch, road-towable tires, rated at 45 mph. The Kinetic Log Splitter is available from authorized Oregon log splitter dealers.